If there’s anything you learn fast when dealing with autosomal DNA (atDNA) — the kind of DNA where testing works across genders and helps you find cousins — it’s that you’re always playing the odds. The odds that someone you think you might match will agree to test. The odds that you and the other person are really related at all. The odds that, even if you are related, you’ll have enough DNA in common to show up as a match. Fun, yeah. But still a gamble. And the more you get involved in these tests, the more you realize just how much of a gamble it is. Which is why everybody involved in genetic genealogy says the same thing: test as many cousins as you possibly can. 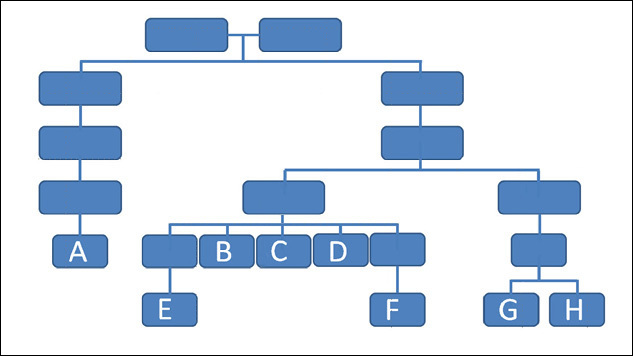 Take a look at this family chart. All of these folks descend from one known couple (who happen to be my 3nd great grandparents, Jesse and Nancy (Davis?) Fore). • A is a great great grandson of the common couple through their son George Washington Fore. His is a straight male line: the couple to their son, grandson, and great grandson. • B, C and D are all full blood siblings to each other, and are the great great grandchildren of the common couple through their daughter Mary “Polly” (Fore) Johnson. So they’re third cousins to A. Theirs is a mixed line: the couple to their daughter to her daughter (the granddaughter) to her son (a great grandson). • E and F are nieces of B, C and D. E is the daughter of an older sister of the trio and F is the daughter of a younger sister. They’re first cousins to each other, and third cousins once removed to A. • G and H are full blood siblings to each other, first cousins once removed to B, C and D (whose father was the brother of their grandmother), second cousins to E and F. They’re also third cousins once removed to A. But look at the variations between the three siblings and the male first cousin once removed versus the female first cousin once removed! In every case, each of the siblings has a significantly stronger match with the female than with the male. Cousin F is fairly closely matched between the two second cousins with only a few centimorgans difference between her DNA in common with the male and in common with the female. But look at the disparity in the results for cousin E! She’s a much stronger match for her male second cousin G than she is for her female second cousin H — and remember: G and H are brother and sister. By far the strongest match for A is not any of his third cousins but one of his third cousins once removed. She has more than half-again as much DNA in common with A as any of the older generation representatives. And her brother? He doesn’t have enough DNA in common with A even to show up as a match. E, who is also a third cousin once removed, is next closest genetically to A, and she has about a third again as much DNA as either of her uncles or her aunt, who are closer to A in terms of generations than she is. F has enough DNA in common to match, and beats out her uncle B in terms of the longest common stretch with A. See what I mean about playing the odds? If we’d only tested G, we wouldn’t have gotten this match at all. Testing G and H would have only improved our odds to 50-50. 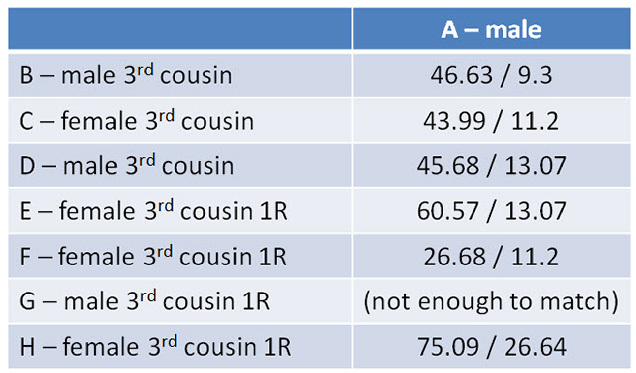 Testing all four second cousins, the odds go up again, but we’d still have failed to see the match in one out of four tests. That’s why you test all the cousins you can. If you’re looking for that match, you want to do your best to stack the deck in your favor. Excellent examples, Judy. I was delighted with the results from my newly tested kinfolk. Dozens of matches showed up that completely missed my genes. It really is sooooo important to test as many as possible, Susan — good luck with your matches! Great article. I sent it to my cousins who have been tested and are anxious for immediate concrete results! Excellent graphic representation of how the DNA lottery works. At Ancestry I have a couple of 3rd cousins who variously show up as 3rd cousin, 4th cousin and 4th-6th cousin with only moderate degree of confidence. My only first cousin to test and I share (at FTDNA) on the low end for first cousins. My son and daughter share on the high end for brother and sister (23&me). And as your chart proves once we get out to the 4th cousin range (3rd cousin 1R) we may not match at all. I have found that having a couple represented in my tree more than once significantly helps the odds of shared DNA and of finding matches. In one case I have Henry BUTTERWORTH and his wife Mary in my tree 3 times! Many others appear twice. Again thanks for your excellent blogs! I learn so much. Thanks, Kelly — and yes, absolutely, the situation you describe (called pedigree collapse since it means you have fewer ancestors than folks who don’t have the same people in different spots in their family tree) will definitely add to the amount of shared DNA. So that inbreeding is good for something LOL! Some of this is in early New England (not many choices in those small towns) and also in some of my Southern lines like the SPARKS more recently. Yep! It absolutely does help in this respect! Kelly, glad you mentioned the New England situation. I have extensive colonial New England ancestry which I have researched for years and have just taken my first DNA test in hopes of maybe breaking a couple of brick walls not related to those ancestors. Given that I, like most people of New England descent, have THOUSANDS of cousins from this population, does that not mean that all these relatives may simply make my task harder by throwing up “noise” in the form of way too many relatives than can be, or you would want to, trace? I’m fixing to send in my kit Tuesday and already I see I’m doomed! I can’t afford to pay for anybody else’s tests, really shouldn’t have spent the money for me. I have only 3 first cousins, 2 on one side and 1 on the other. We’re all female only children. I haven’t worried about the lack of a paternal paternal testing candidate because I have that line back 9 generations to a man born c1627. The major paternal brick wall relates to a situation where the records don’t go any further back. Everybody gets hung up around 1790 because there aren’t any more records. This isn’t a case where somebody moved or got adopted or anything like that. We know who the guy was and because of patronymics, we know his father’s first name. There is just no documentation further back except possibly some land/court records I can’t find and can’t even find anyone who has the slightest clue where they might have ever been. As for the cousins, one might go for the idea of testing but she’s got some dementia and I am not sure about suggesting it. The other 2 cousins, on my mother’s side, are unlikely to be interested. One would probably do it if I paid but actually she’s got more money than I do. Anyway, even if I did get them to test, it wouldn’t answer my major maternal question which is a mtDNA one and both of these cousins are children of my mother’s brothers. So, I’m going to have to get lucky which given my history is asking more than the universe is going to give. Not doomed, exactly — but… becoming a DNA junkie can sure be expensive, Jo! Still, you may be surprised at what you find just with your own results. Maybe in the future you can scare up another cousin or two to test.